Here is a book that is both clarion call for a new Jewish agenda and a blueprint for an adventurous but genuine path toward spiritual growth and religious wisdom. Rabbi Niles Elliot Goldstein, founder and Rabbi Emeritus of The New Shul in New York City, says that most conventional Jewish institutions are out-of-touch and have relied too much on nostalgia, guilt, and fear—none of which resonate with modern Jews. He challenges Jews to adopt the “gonzo” spirit—the rebellious, risk-taking attitude associated with the gonzo journalist Hunter S. Thompson—and to take creative, innovative steps to reshape and revitalize contemporary Judaism. Goldstein urges readers to take a fresh look at Judaism, to become educated about its history and tradition, to discover what is authentic, yet what also feels spiritually relevant and meaningful, and to create a Jewish culture and community rooted in affirmation, joy, and celebration. 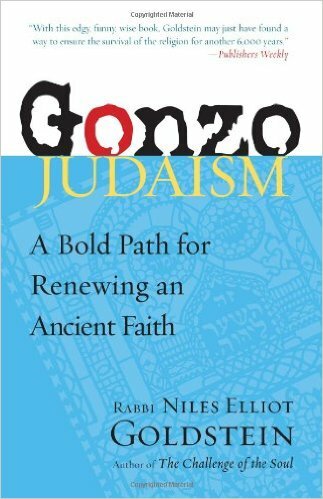 He provides a wealth of information on numerous organizations, institutions, synagogues, grassroots groups, and networks that can help get you started on the gonzo path.